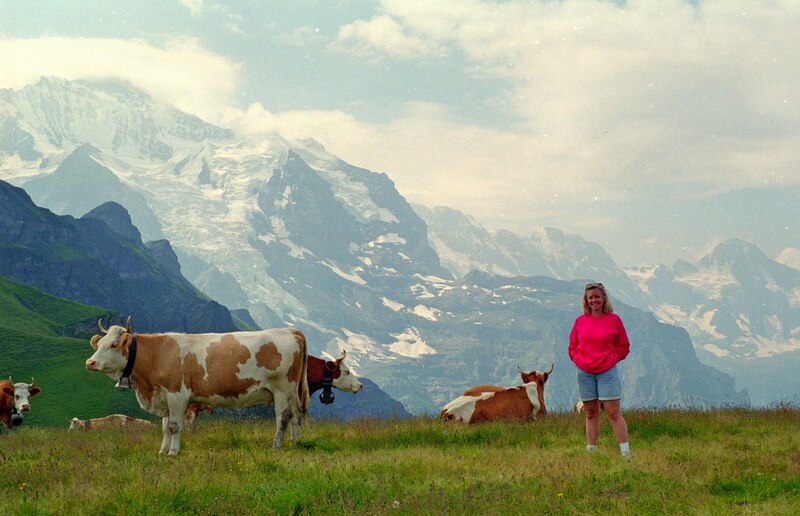 My mom says I asked to have my picture taken with these cows in the Austrian Alps when I was 3 years old. So I couldn't resist another chance 30 years later in the Swiss Alps (sans the feathered Tyrolean hat and dirndl). Check out DeliciousBaby.com for lots of exciting Photo Friday entries. I love that you are doing then an now photos like these! When I was a child my family didn't travel; you were so blessed to have the experiences! I think I might have had that same outfit. I love the before and after pictures that you do! Its great that you have those old photos. By the way were you shouting "Ricolla!"? Love the before and after picture! I don't know. I think you should have had a tyrolean hat on in the later picture too ;-) At least your mom took you to cool places. All I remember is sitting on several civil war cannons along the east coast. Of course now I will need to get a picture of my son on a cannon. Tradition has to live on after all. Love the 30 year span between pix and I love the cows and the alps. So gorgeous there! Here from R We There Yet Mom?